This detached home is just a stone's throw away from the sea. It is located in a peaceful residential area, close to the beaches, on the stretch of coastline between Catania and Syracuse. The property offers good privacy and features cosy and comfortable furnishings enriched from 2019 with a lovely new bathroom. 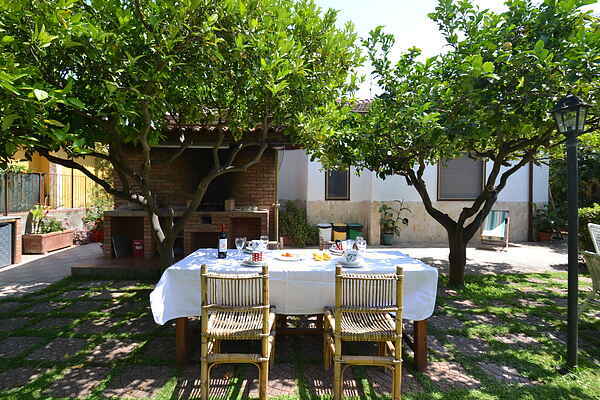 The house has a large outdoor area with terraces and a charming garden (120m2) of citrus trees. On clear days, catch a glimpse of the volcano Etna and its imposing smoke. The sandy beach offers moments of relaxation, rocked by the sea breeze and Sicily's generous sunshine. The property’s location is ideal for golf enthusiasts (see tips owner) and for daily trips to eastern Sicily’s cultural and natural wonders such as Taormina, Etna, Syracuse, Vendicari nature reserve, Noto, Ragusa and other Sicilian Baroque centers. The friendly owner can supply guests with a one-man kayak upon request.